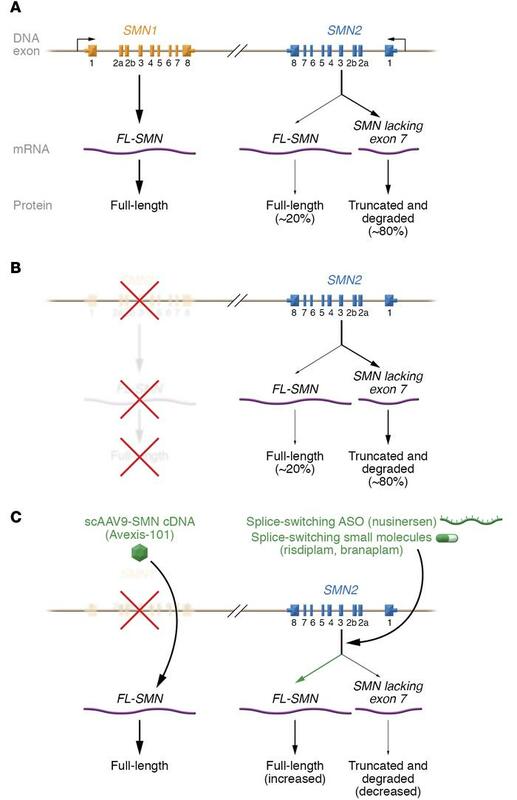 The SMN1 and SMN2 genes that cause SMA can each be targeted by different therapeutic strategies. (A) SMN1 and SMN2 gene expression in a healthy individual. (B) Schematic of SMA genetics. (C) Therapeutic mechanism of scAAV9-SMN1 cDNA, the splice-switching ASO, and the small molecules risdiplam (RG7916) and branaplam (LMI070) currently in clinical trials (see Table 1).